1. In a large bowl, cream the butter and powdered sugar. 2. Mix in the egg and the vanilla. 3. Add in the flour, cocoa powder, and salt, and mix until the dough forms. 5. Preheat the oven to 375 F and line a baking sheet with parchment. 6. Roll out the dough and cut using cookie cutters of your choice, re-rolling scraps until you’ve used as much dough as you can. 7. Transfer the cookies to the baking sheet(s) and bake for 7-9 minutes. Make sure that you don’t burnt he cookies, as they are dark anyway so it can be hard to tell. 9. Melt the chocolate in separate bowls and get your toppings ready– it’s time for the fun part! 10. Once the cookies are cooled, dip them in the chocolate and press toppings into them one by one, in different combinations until you’ve used up all of the cookies. 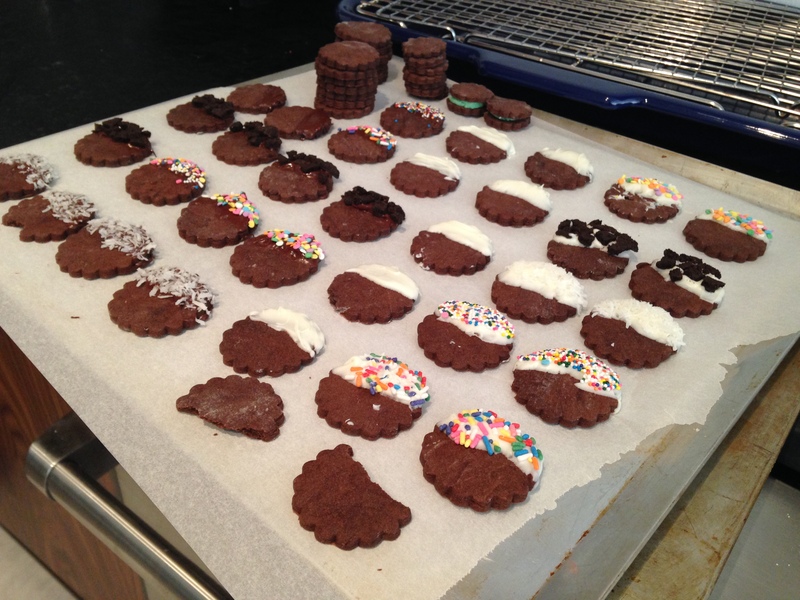 Put the finished cookies on a non-stick surface such as parchment or wax paper and let the chocolate set before eating. Next time you feel like baking cookies, instead of turning to your standby sugar cookie recipe, try something new and give this one a spin. Happy nibbling!